Observation - Green Silver-lines (Pseudoips prasinana) - UK and Ireland. 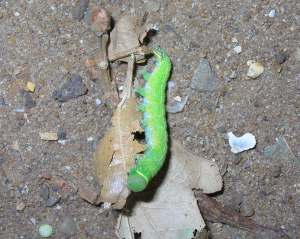 Description: Green Caterpiller, spotted under an Oak tree. I has a small red line on its tail, i think it was probaly around 2 long. Green Caterpiller, spotted under an Oak tree. I has a small red line on its tail, i think it was probaly around 2" long.